and figure 12b has its own scale bar. Figs. 1, 3, 5-7. Cycladophora clathrostomia. All BSS; 28B(III/150); 27B(F) EF F49, 28B(II/175, 11/178 and 11/173). Note that, aside from the closed thorax in figure 1 versus the development of a girdle in fig. 6, the two forms are essentially the same. Figs. 2, 4. Cycladophora davisiana. BSS 15B(F) EF E26 and BSS 38B(F) EF K54. Fig. 8. Tripodoconus hirundo. BSS 31B(FI) EF A32. Figs. 9-11. Pterocanium praetextum. IOW 164(F), BSS 19B(F) EF R55 and BSW 47(F) EF J19 showing abdominal development, including a closed "sac" (fig. 9), a straight curtain between the feet (fig. 10) and no abdominal section (fig. 11). Figs. 12a,b. Pterocanium charybdeum. BSS 28B(II). Fig. 12b is an enlargement of the - atypically developed (see also pl. 73 figs. 1-6) - apical spine. 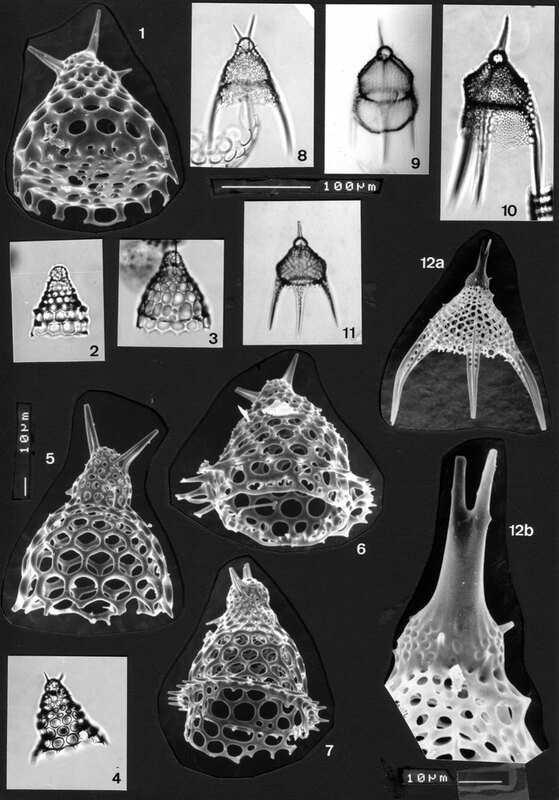 Cephalic pores (presumably open in "juvenile" specimens) have been filled in with silica.